Why settle for a paper-thin, flat cross? Apples of Gold Jewelry's 14k rose gold cross pendant for men is fully solid through and through and has depth to it. Add to this the unique hue of rose gold to achieve a quality and unique men's cross. Also available in 14k yellow or white shown below. The rose gold cross pendant measures approx. 1 3/8" tall x just under 1" wide and approx. 2.9mm thick (1 11/16" tall with hoop/bale) and weighs approx. 8.5 grams. Get it with a matching women's cross, also shown below. Add a 14k rose gold 1.5mm cable chain in 20" (optional). 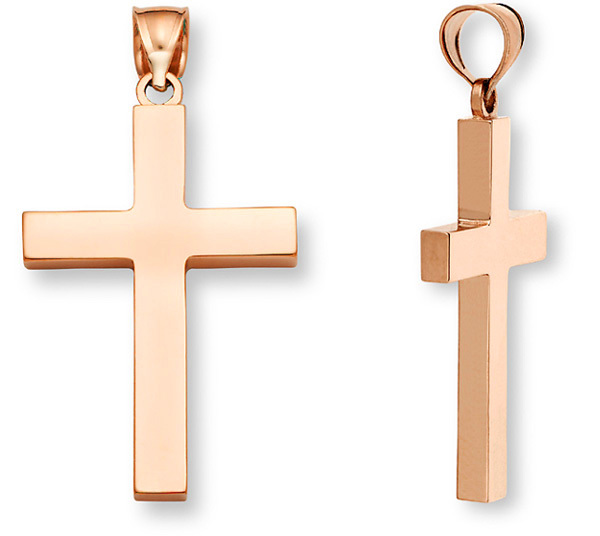 We guarantee our Men's 14K Rose Gold Solid Cross Pendant to be high quality, authentic jewelry, as described above.